Federation of Pilling Specialists - Announcing the FPS Annual Golf Day! Announcing the FPS Annual Golf Day! Iron your plus fours, dig out that Pringle Sweater – it’s time for the FPS Annual Golf Day! This year’s FPS Annual Golf Day will take place on Wednesday 12th September at The Nottinghamshire Golf and Country Club, in Nottingham. It’s a stunning location set within 340 acres of rolling countryside and just 6 miles from Nottingham city centre. Members are invited to play 18 holes of golf on the venues’ recently renovated Championship course, which is set around an impressive lake and waterways complex. 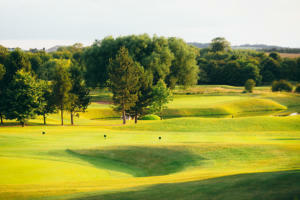 The course is known throughout the midlands as a true test of golf. Places cost just £64 +VAT per person, which includes tea, coffee and bacon rolls on arrival, 18 holes of golf and a three-course dinner complete with pre-dinner drinks reception. Rooms can be booked directly at The Nottinghamshire Golf and Country Club, at the special rate of £79 (single occupancy) or £89 (double occupancy) per night, including breakfast. If you wish to book a room, please call the hotel’s reservations team directly on 0115 933 3344 ext 223 and quote FPS Golf Day, 12th September. Rooms will be allocated on a first come, first served basis and are being provisionally held until Wednesday 15th August 2018. If your company would like to attend, please request a booking form fps@fps.org.uk and return it before Tuesday 4th September. Booking forms received after this date will not be accepted.